A launch day programme of wellness-related activities included Yoga, sensory based writing and fitness; workshops on understanding Alzheimers, self-defence and reflexology as well as sessions on exam anxiety and the importance of sleep which gave pupils and staff a taste of what to expect in the future. 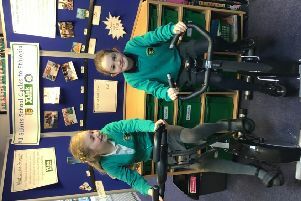 The major new wellness initiative is designed to support pupils aged two-18, parents and staff and will be the hub for a wide range of activities to support and encourage all-round physical, social and mental wellbeing. A special presentation was given by Stonewall ambassador Rob Partington who focuses on tackling homophobic, biphobic and transphobic bullying in schools. As the Headteacher at a school in Manchester, Rob has fully embedded the concept of equality, diversion and inclusion into his school’s ethos. Pictured, from left, Director of Wellness Richard Farnan; Assistant Director of Wellness Laura Brookes; Shaw Mind Foundation CEO Kate Majid; and the School’s Wellness Prefect Mollie Wilson at the official Wellness Centre opening at Harrogate Ladies’ College.